More about the stair runner - where is it from? what type of material? The stair runner was procured by the home owner. I love your stair case! 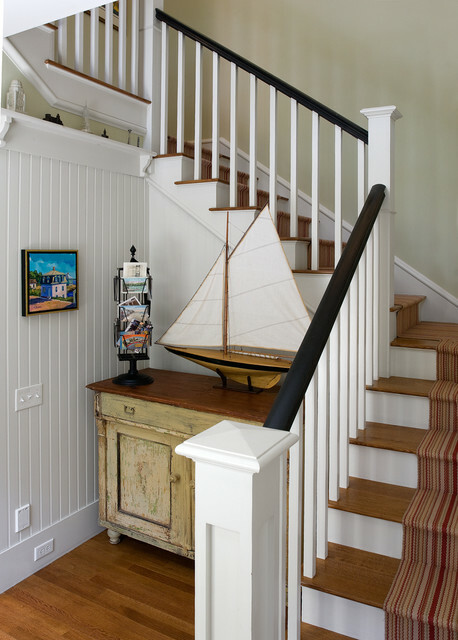 - Love your staircase! Good Job! Could you tell me what kind of wood your hand rail is and what stain you put on it? That looks to me to be probably an oak stair rail, you can purchase by the foot at hd. It doesn't look stained, it looks painted using a semi gloss or pearl sheen. To achieve the look, go with a softer black or even a dark brown. Painting instead of staining makes it easier to clean plus gives it a lasting sheen. jojocat added this to Doors and walls and floors Oh My!